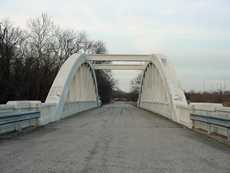 Kansas' Route 66 Bridge, Baxter Springs, Kansas. 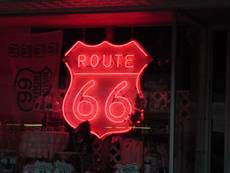 While the former Route 66 stretches comfortably across some states (Arizona, Missouri, Oklahoma and New Mexico), three states get short shrift. California (because of its narrowness), Texas (where it crosses at the narrow Panhandle) and Kansas - where it enters and exits before you realize you've been there. 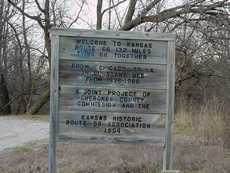 The "Mother Road" runs a mere 13 miles across the SE corner of Kansas and Baxter Springs was the only Kansas town along the route. 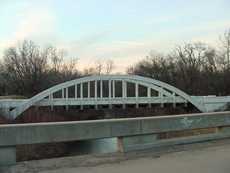 But every dog has it's day and although Kansas can't claim a long run on 66, what it can claim is one of the more interesting relics of the Route - the unusually attractive (and ridiculously small) bridge shown here. We learned of the bridge from Wendy, a friendly and helpful veterinarian's assistant in Baxter Springs who took us in even though it was five minutes before closing time and the doctor was in another town. Wendy eased our dog's discomfort and while doing so she mentioned a local "white bridge" where local teenagers used to gather. The bridge served as a sort of de facto bulletin board where news, messages, threats, challenges and the constantly changing status of romantic relationships were left (in the attention-grabbing medium of spray paint). 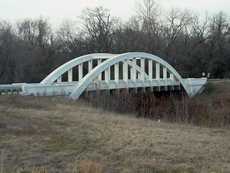 Needless to say the bridge was soon a daylight eyesore. Being a little off the current beaten path, local police could do little to curb the postings - that is until a new anti-grafitti paint (containing Teflon) appeared. Now, when a would-be "artist" goes to leave his mark, his statement slides slowly down into a colorful puddle. Who said those billions of dollars spent on space exploration haven't paid off? 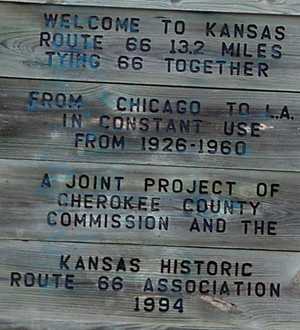 Anyone wishing to share memories, stories or information of the Baxter Springs Route 66 Bridge, please contact us.